October 23, 2013 – SANA Report –Army units continued operations against terrorists across the country, achieving considerable advance and inflicting heavy losses against their gatherings in several areas and destroying their weaponry. The army units killed and injured tens of terrorists, the majority of them of non-Syrian nationalities, in many areas in Lattakia northern countryside. A military source told SANA that the army destroyed terrorists’ gatherings in the areas of al-Mureej, Ta’ouma, Khan al-Jouz, Marj Khoukha, al-Rawda and al-Tuffahyeh in Lattakia northern countryside. The source added that the army also destroyed large numbers of vehicles equipped with heavy machineguns and two weapons’ warehouses in addition to many locally-made rockets. Among the killed terrorists were Abu Ghayath and Hamad al-Marzouqi, from Jordan, Mohammad al-Habayna, from Palestine, Abu Talhat, from Chechnya, Abu Mo’taz, from Iraq, Abu Mohammad Bojabra, from Morocco, Ahmad al-Fattahi, from Kuwait, in addition to many terrorist groups’ leaders affiliated to the terrorists organization of “The Islamic State of Iraq and Levant”, including Abu Othman al-Dayrani, Assaf al-Faqhi, Ahmad Ataya and Majed al-Kurani. Army units discovered a new tunnel for terrorists in Barzeh neighborhood, eliminating entire terrorist groups during intensive and successful operations against their dens in Damascus countryside. An official source told SANA that army units discovered a 110-meter-long and 5-meter-deep tunnel in Barzeh neighborhood. The source said that the tunnel extends from underneath Tishreen hospital road, starting from one of the old Damascene houses to the west of the Syrian Educational Channel building on the other side of the road. The discovery comes few days after a tunnel more than 300 meter long and 10 meter deep tunnel was discovered underneath Damascus-Homs highway linking Harasta city and al-Qaboun and Barzeh orchards that terrorists have used for residence, movement and storing weapons. The source pointed out that army units inflicted heavy losses on the armed terrorist groups and regained control over Hteitet al-Turkman town, achieving fresh advance in pursuing the residual terrorist groups after military blitzes that resulted in killing Ammar Hazbar, leader of a terrorist group, Said al-Ghazzawi and Fares al-Ghorani. Several terrorists, affiliated to the so-called ”al-Kaa’Kaa’ Brigade” to the east of Shabaa town, among them Abdul-Rahman al-Asmar as other units continued operations against terrorists in the vicinity of Tameco company for pharmaceutical industries in al-Mleiha town. Omar al-Debes was identified among the dead. The source said that hideouts for terrorists, with the weapons and ammunition inside, were destroyed during a qualitative military operation in Alia farms in Duma city, killing several terrorists, among them Youssef al-Afandi. Also, a sniper was killed to the east of Cars automobile company in Harasta, along with a number of terrorists in the area surrounding Zamalka node and east of al-Manasher roundabout in Jobar neighborhood. In al-Maadamieh, a number of terrorists were killed in a qualitative operation by an army unit against their gatherings in Al-Hamdan quarter as another unit killed a number of terrorists, among them a terrorist nicknamed Abu Farouk, and destroyed their weaponry in Darayya city. The source added that an army unit pursued an armed terrorist group in the vicinity of al-Tiba town in al-Kisweh area and killed several of its members, among them Majdi Issam Shalbak, as another unit clashed with an armed terrorist group in Maadamieh al-Kalamoun town and killed most of its members, among them the group’s leader, called Said. A military source said that army units destroyed an arms cache and a concentration for terrorists northeast of al-Nabek and Jairoud and a mortar cannon east of Adra and rocket launch-pads east of Deir Attieh, as other units chased armed groups north of Yabroud and northeast of Tal al-Dhahab in al-Rheiba, eliminating several of its members. Army units pursued terrorists infiltrating into Sadad town, as they killed many terrorists, injured others and destroyed their cars loaded with weapons in several areas in Homs province. An official source told SANA that an army unit hunted terrorists who infiltrated into Sadad town reaching al-Talla neighborhood, killing many terrorists and injuring others, in addition to destroying their weapons. The source added that members of armed terrorist groups were killed in Jouret al-Shayyah and al-Qarabiss neighborhoods and near Khadija al-Kubra School in al-Qussour neighborhood in Homs. Another army unit eliminated armed terrorist groups in Mahin and Hawarin villages, the source added. The source pointed out that army units destroyed cars equipped with heavy machineguns that were transferring terrorists, weapons and ammunition in Sritel hill in Jabal al-Shaer area in Palmyra, while another unit killed members of armed terrorist groups near al-Dar al-Kabira and the surrounding area of al-Rastan city. Units of the armed forces carried out operations against terrorists’ dens and gatherings in Aleppo countryside, killing and injuring many of them. A military source told SANA that the army units killed and injured many terrorists in the villages and towns of al-Jadyda, Kwaires and Rasm al-Aboud in the eastern countryside of Aleppo. The source added that the army units also destroyed a number of terrorists’ dens, gatherings, mortars, rocket launch-pads and large amount of ammunition. The source pointed out that other army units destroyed two cars loaded with weapons and ammunition to the north of Deir Hafer and other 3cars on al-Bab-Aleppo road. A unit of the armed forces killed all members of an armed terrorist group in the area surrounding Saraqib city and destroyed a number of cars loaded with weapons and ammunition. Meanwhile, other army units destroyed terrorists’ dens in the villages and towns of al-Dabshiyeh, al-Baragithi, Kafr Shlayeh and the area surrounding al-Arba’en mountain, inflicting heavy losses upon terrorists. The source added that an army unit killed all members of an armed terrorist group who were attempting to sneak into Ghanoum farm in Maret al-Nouman countryside, destroying their weapons and ammunition. The source pointed out that other army units destroyed 6 cars loaded with weapons and ammunition in Maar Tamsaren, killing and injuring many terrorists. A military source told SANA that an army unit destroyed a terrorists’ den in al-Anqiyeh village in Hama countryside, killing and injuring 30 terrorists, most of them non-Syrians. The source added that among the dead terrorists were Muhsin Abu Hamzeh from Egypt, the Iraqi Dyab Mohammad and terrorists Ali Gharib, Mohammad al-Hussin, Shadi al-Yasin, Hussin Hussin, Faraj al-Jasim and Sheikh Abdulmo’ti. 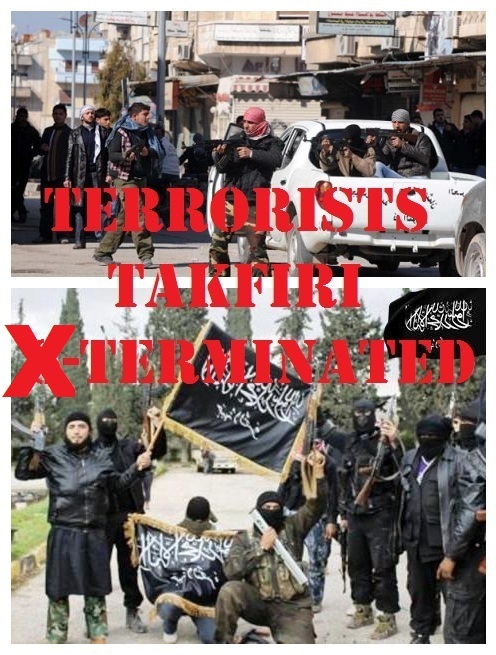 This entry was posted in +AAArchive, foreign-backed insurgency, foreign-backed terrorists, Free Syrian Army, Syrian Arab Army, Takfiri militant, Takfiri terrorists, terrorism, Terrorists, Terrorists killed, War Against Terrorism, War Criminals, War on Syria and tagged foreign mercenaries, foreign-backed insurgency, foreign-backed terrorists, Free Syrian Army, Jabhat al-Nusra, Syrian Arab Army, Syrian Army, Syrian Patriots, Syrian Resistance, takfiri, Takfiri movements, Terrorisme, Terrorist attack, Terrorist killed, Terrorists, Terrorists Gangs, Terrorists surrender, War against Syria, War Against Terrorism, War Criminals, War on Syria, Zionist conspiracy by syrianetwork. Bookmark the permalink. This is great news. However, Russia must do something about Prince Bandar Bin Sultan before he brings the terror he has unleashed on Syria to Russia in a big way-something which he plans to do, according to many media reports. The latest kidnapping of a Russian engineer in Syria has been done in the order of Prince Bandar bin Sultan. Putin must send a word to Prince Bandar bin Sultan that threatening Russia is very bad ideas for the Saudi Royal family.